Costumers and Harry Potter fans alike, have we got an event or two for you! CONsole Room 2018 will have TWO costuming competition opportunities – a Hall Costume Contest on Friday and a Costume Showcase on Saturday. Further details on how to compete in both are on our COSTUMING COMPETITIONS page. 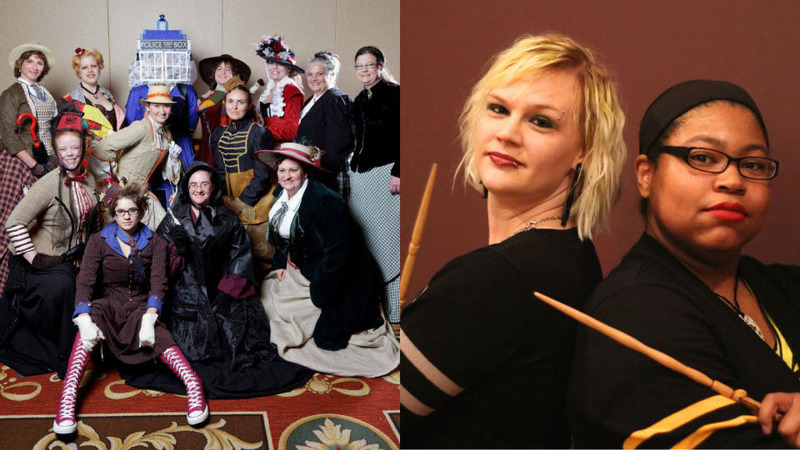 Our judges for this year’s Costume Showcase are non other than the VICTORIAN LADY DOCTOR COSTUMING GROUP! The Victorian Lady Doctors are a group of persons who like to sew Doctor Who themed costumes and cosplays, local to the Twin Cities. They’ve also hosted the popular Sunday Tea at CONvergence. We are also thrilled to announce that SLYTHERPUFF will be performing for our Costume Showcase halftime show! SlytherPuff is a local comedy Wizard Rock Duo who perform original and cover songs about their favorite fandoms, including Harry Potter, Marvel, Mad Max, and more! Maren brings the Slyther, and Morgan brings the Puff! You can learn more about our Featured Guests on our GUESTS page.